(2) We have an ice time on Saturday December 28 at 7:30pm in Rossland - this ice time is COED – bring a nice buddy – also…….. in the spirit of the holidays I am thinking that we should all head over to the shovel for a beer together afterwards…..anyone interested? Anyways, hope to see you all on Saturday. Have a fantastic Holiday Ladies!! (1) We have an ice time Saturday @ 11:30am on the big ice in Trail - Bring a Buddy!! ii. Gift exchange – 10$ max – you don’t have to participate but it is always a ton of laughs – gag gifts are a must!! Anyways, it’s Friday so I thought I would ensure everyone is up to speed on this coming weekend. Hope to see you all out! Just a reminder that we have hockey in Trail tonight, 8:45pm, big ice. The Buds are fun group to play with, we divide up evenly and it's all good. Does anyone know if we have a goalie? Please let me know and I can bring the gear if needed. Come on let's have a good turnout tonight! Saturday Dec 14th - Bring a Buddy! Hey Ladies!! well there is lots o hockey this week!!! Starting tomorrow (Dec 11th) with a friendly mix up with the Budz 8:45pm in Trail, big ice, we have been invited to their ice twice and them to ours... It is alot of fun, chill hockey where we mix up and play with the men not against... so hopefully we have a good turn out, and Ida has offered to play net for us, thank you!! On Saturday I have been waiting to here back from Nelson but it doesn't look that promising for them to come... we can do bring a buddy co-ed will be fine cause I think our numbers won't be too high, but lets try and get two goalies for that day, does anyone want to take that on, I have way too much going on at the moment... (I am timing for Cross Country skiing all weekend) THEN PARTYSATURDAY NIGHT!!! let's get er going early!! AND THEN SUNDAY we play the cougars!!! wowsers that is a lot of hockey... sorry I wish it could be spread out a little better. Hopefully see you starting tomorrow night!!!!!!!!! Hey ladies, reminder that is bring a buddy or more (friendly guys are fine) to our regular ice in Trail this weekend at 11:30, there are no goalies lined up that I know of and we will have the smokettes gear in GF, if anyone wants to line up the goalies, go for it or just wing it like we did last weeekend and it was super fun... hopefully those of you not going to GF will play in Trail. A date has been set for the evening of December 14th, time and location yet to be determined, more info to come to Smokettes by e-mail. The calendar on the web page has now been updated for the rest of the season. Please see below for line by line schedule. Kari is working in redoing the monthly calendar. If anyone has a copy please let someone know so she does not have to redo it. If there are any mistakes please e-mail trailsmokettes@gmail.com Thank you. We desperately need a goalie this weekend. As well we need players. If you can only make it for 1 or 2 games as opposed to the whole weekend that would be a big help. It is $15 a game and as of now we only have 9 players. What about coming for Sat afternoons 5pm game, party down we are all going stay in a motel (probably across from arena) and play Sun. morning 8am and 2pm (I think). No pressure (ok just a little). Hope to see you this weekend it's going to be fun! Please attend this planning meeting 6:30pm at Holly's. (From Grand Forks) Hi everybody! Here's a picture from the fund raiser for Carol this summer, a little late but a nice picture. Thanks everyone. last year we had 13 it was super fun we met for dinner first at the GRAND hotel! Please get back sooner then later!! thanks! Smokettes have not committed to this tournament but thought I would put it up on the web page incase there is interest. "Tri Cities Round Robin." More details coming soon. 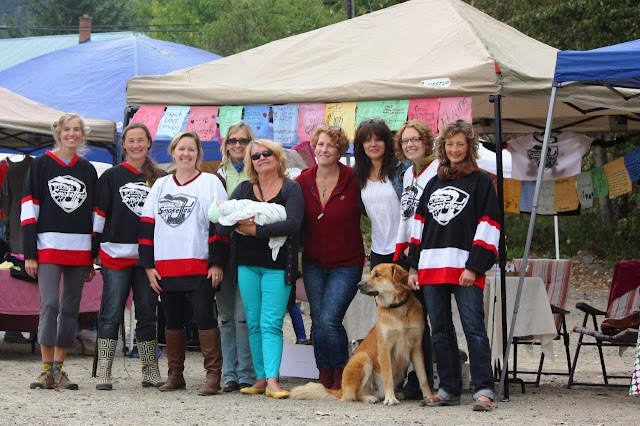 Gulch Cats & Kootenay Cougars Ice Hockey Tournament! The Kootenay Cougars are co-hosting a tournament January 31, Feb 1 & 2 with the Gulch Cats mens team and we have yet to decide if we are going to join or not. Banquet - Dinner and Dance featuring Blue Crush Band! If you are interested please voice your opinion at the Smokettes locker room. The Betty's Mixer hockey tournament will be on Friday Nov 29th to December 1st. They are looking to having 6 men's teams and 4 ladies, but are trying to have 6 ladies teams as well. If you are interested please let someone know in the Smokette's locker room know. Sign up before Nov 1st. Sign up for the game in Nelson on Nov. 1st and both upcoming tourneys in Kaslo and Grandforks are $55.00 each, the sign-up book will be at hockey!! Bring your cheque book! ps. we are not committed to any other tournaments until ours in February. Maybe the Cats/Cougars on Feb 1st.